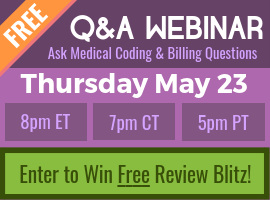 The August 2016 Q&A Medical Coding Webinar from Certification Coaching Org (CCO), www.cco.us, presented a variety of topics of interest to medical coders and billers. Topics included Transitional Care Management (TCM) – Medical Decision Making (MDM) Leveling, Breast Cancer: Specific Details Now Required, Wound Care Centers, HTN: Controlled vs. Uncontrolled, Abdominal Aortic Aneurysm Repair Coding, and Cardiac Cath Clarification – Congenital Defects. The CCO VIP opportunity and CCO’s Lunch & Learn Coding on FB Live, were also discussed. Attendees’ questions on various coding topics were answered. Educational topics were presented by Jo-Anne Sheehan, CPC, CPC-I, CPPM; Chandra Stephenson, CPC, CIC, COC, CPB, CPCO, CPMA, CPC-I, CCS, CANPC, CEMC, CFPC, CIMC, CGSC, COSC, CRC, CCC; Alicia Scott, CPC, CPC-I, CRC; and Laureen Jandroep, CPC, CPC-I, COC, CMSCS, CHCI, CPPM. The host for the webinar was Boyd Staszewski. 4. First Webinar With Us? Poll How many CCO webinars have you attended? CEU Certificate Download Link Ask Along the way in the Questions box. 7. Why Stay To The End? Giveaway! 9. CONGRATS! CCO Courses Recent Exam Passers! 10. CONGRATS! CCO Courses Recent Exam Passers! 11. CONGRATS! CCO Courses Recent Exam Passers! 12. CONGRATS! CCO Courses Recent Exam Passers! 13. Poll Poll Poll – Are You Certified? 14. Q&A August 2016 Let’s Do This! 18. Poll What AAPC coding credential do you HAVE? CPT® Professional App, featuring a handy code lookup tool, a powerful E/M code selection wizard and hyperlinks to pertinent CPT Assistant articles. Use on up to 5 devices! Traditional book lookup using the time-tested organization and indexing of CPT Professional, or the digital power of the CPT Professional App. 33. Preparing for the CPB Exam: Joanne, I am going to be taking my CPB exam on 9/10 any advice? What to study? Thanks 🙂 Jennifer Know how to read and apply the NCCI with choosing CPT codes, know modifier usage. Understand reports such as an A/R reports. Know insurance models such as HMO, PPO etc., BCBS, Medicare, Medicaid, Work Comp, Commercial carriers and TRICARE. Know the different laws involving Fraud and Abuse, Truth in Lending, False Claim Act, etc., requirements for credentialing, how to register a patient, and verify insurance coverage. Review CPT, ICD-10-CM and HCPCS.Know the rules for medical necessity involving NCCI, NCD and LCD. Know how to fill out a CMS-1500 form and a UB-04. Know about EDI. Retake your chapter tests as often as you can for practice and to gain speed and efficiency. ● Chiropractic billing is very different than medical billing. I would recommend going onto each payer website to get their specific requirements for coding and billing. ● Medicare has very specific requirements. They are restrictive. They do not pay for X-Rays, office visits, modalities, manipulation of extremities. ● Medicare also requires a specific modifier against the manipulation codes. ● NP practices have to abide by state laws and they vary widely. Contact the Board of Nursing for your state and understand the NP’s role on certain procedures such as giving BOTOX injections. 37. Rules re: non treating provider I do wound care coding…where can I find the “legal” document pertaining to a provider who is on vacation and another provider doing a “new” refill rx? I think that the non treating provider can put in notes stating they have read and agree with the treating provider – do they also have to explain why they are doing the refill as the non treating provider? Need help please. ● Look up the rules on Locum Tenens and Substitute Physicians under Reciprocal Billing. https://www.cms.gov Enter the key words in the search bar. ● There are specific guidelines for both so match the criteria that applies to your office. ● Q5 is a service furnished by a substitute physician under a reciprocal billing arrangement. ● The regular physician is unavailable to provide the visit services. ● The patient has arranged or seeks to receive the visit services from the regular physician. ● The locum tenens provider is paid for his/her services on a per diem or similar fee-for-time basis. ● The substitute physician does not provide services to Medicare patients over a continuous period of longer than 60 days. 41. Digital CPT – Is the electronic CPT for just phones or is it a app that can be used on tablets? The electronic CPT can also be on a tablet such as the IPad. 44. Jo-Anne Alicia Laureen Chandra Darcy Happy Coding! 45. Join our Coding Community https://www.cco.us/webinarvip Thanks For Coming!